At Ararat Farm we raise intensively managed, mob grazed beef. This means that they are moved onto fresh pasture at least daily (we try for multiple moves a day through the summer). This keeps them away from their manure and parasites and gives the grass adequate rest for regrowth. The mob grazing stimulates the microbes in the soil into overdrive, pulling minerals and nutrients to the grasses increasing leaf growth. This results in a rich, lush variety salad bar that the cattle graze on. Even in the winter we are able to graze most of the way through with just a little grass hay supplement. The cattle are grass finished which means that they are grassed completely to slaughter weight on pasture with no added feeds. We have switched to using South Poll cattle. This breed is a hardy, southern grass cow that gives us a step ahead on selecting quality genetics. We rely on good genetics and management to ensure our herd performs well without inputs, such as vaccines, grain feed or hormones. Grass cattle are breeds of cattle that perform well on pasture as they were created to do; as opposed to grain cattle breeds which are suited for the manure lagoon feed lots that most beef is fattened in. South Poll cattle are low maintenance, low input cows that raise fat calves on our grass pastures. Their gentle temperaments allow them to gain weight quickly providing you with a flavorful and juicy meat. Our herd has not grown big enough to fill our customer demand so we also have to purchase stocker calves that we raise for slaughter. We strive to only purchase these from farmers who have not given them any grain, hormones or vaccines. We give our cows a long and happy life with only one bad day. Our target weight for slaughtering is carcass hanging weight of roughly 500 lbs. We sell the beef by the carcass weight which is a standard weight used by producers and butchers to determine value. Typical take home weight is roughly 70% of the carcass weight. When you pick up your beef, each cut is individually labeled and vacuum packed for your convenience. A visual difference between grass fed/finished and grain fed beef is the marbling. Grain fat gives a very visible yellowish fat marbling which is high in omega 6 fatty acids. Fat from proper grass grazing is a clearer fat marbling that is not as visible. This fat is high in omega 3 fatty acids and CLA. Our beef is sold by the 1/4, 1/2 and whole. We butcher in the Spring (May) and Fall (September) to ensure you are always stocked up in beef. We have recently partnered with Naturally A Deal (an online food co-op) to sell our ground beef. Ararat Farm is dedicated to bringing you the healthiest, most flavorful pork. 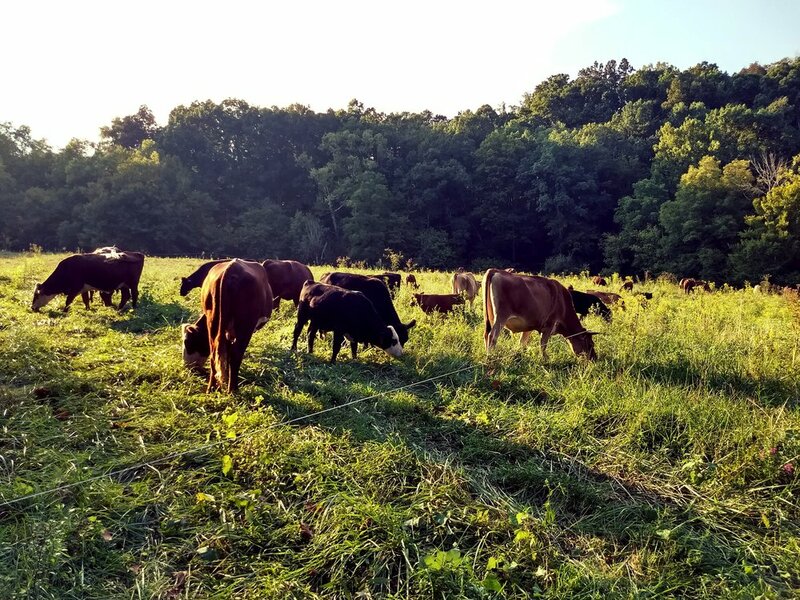 Our herd of heritage breed pigs is rotated through an abundance of fresh pasture and lush woods to allow them to forage an incredible variety of nutrients. This causes the pigs to thrive and make fat and juicy, mouth watering pork. We manage the pigs differently than the cows when it comes to the ground they are on. We leave the pigs on the ground longer than the cows in order to provide proper stimulation to promote plant root structure and soil microbes from the pigs tillage. Pigs need to be managed so that they provide proper stimulation and not cause erosion or deforestation for the flora and fauna. We purchase weened piglets from local producers who raise a variety of heritage pigs. These are older breeds that perform well with foraging instead of a grain only diet. Breeds such as Berkshire, Hampshire, Large Black and Red Waddle just to name a few, are what we have used with delicious success. The unique design of pork fat, allows it to absorb flavor from its food within a month of changing it’s diet. This gives us the ability to bring you a seasonally flavored pork, with lush greens in the summer and rich acorns in the fall (for you food gourmands, acorn fattened pork is a high dollar delicacy in Spain). We do use some supplemental grain feed (which is okay because pigs are omnivores). We purchase this from a local mill and the grain they carry comes from a neighboring farm. Our pigs are not given any hormones or antibiotics because we use Diatomaceous Earth and apple cider to cleanse them of parasites. Just like the cows, the pigs have a very happy life with just one bad day. Our target weight with the pigs is roughly 175 to 275 lbs. hanging carcass weight. We sell the pork by 1/2 and whole per lb. of carcass weight. We sell the pork by the carcass weight which is a standard weight used by producers and butchers to determine value. Take home weights are roughly 75% of carcass weight. The butcher who serves us is able to not only make fantastic sausage (MSG&Gluten Free), but is also able to both smoke and brine cure ham and bacon (brine curing is how grocery store bacon is cured). When you pick up your pork, each cut is individually labeled and vacuum packed for your convenience.